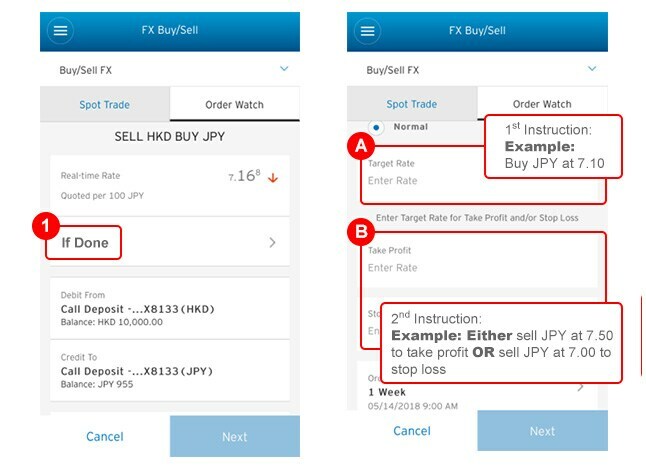 FX Order Watching Service allows you to set up an online FX order to trade easily anytime around the clock. We will conduct the trading of your designated currency / gold when the pre-set criteria are reached. You can buy / sell 10 major currencies that include EUR, USD, GBP, NZD, HKD, CAD, AUD, CHF, JPY and SGD. 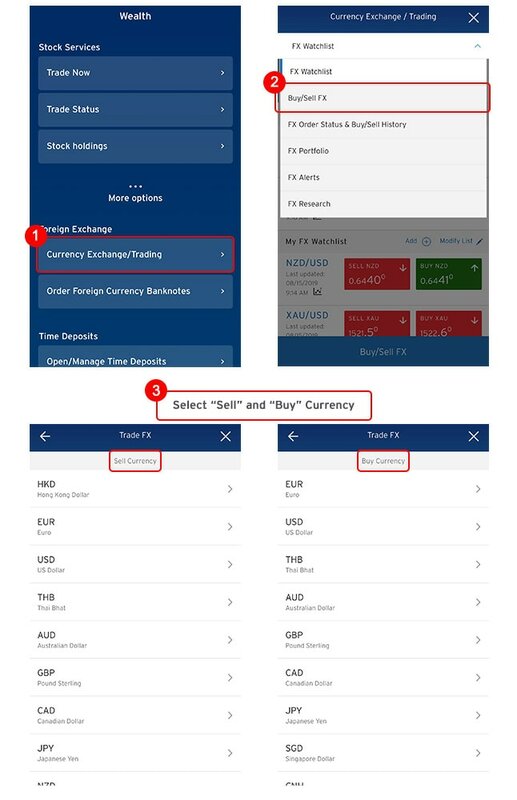 You can set up your online FX order easily with Citi Mobile® App. We will conduct 24-hour buy/sell of your designated currency, when the pre-set criteria are reached. "If Done" Order: An order involving two sequential instructions in which when the first one is executed, then the second instruction becomes activated. The second instruction can be an OCO order. Execution of either one of the 2nd instruction will automatically cancel the other. 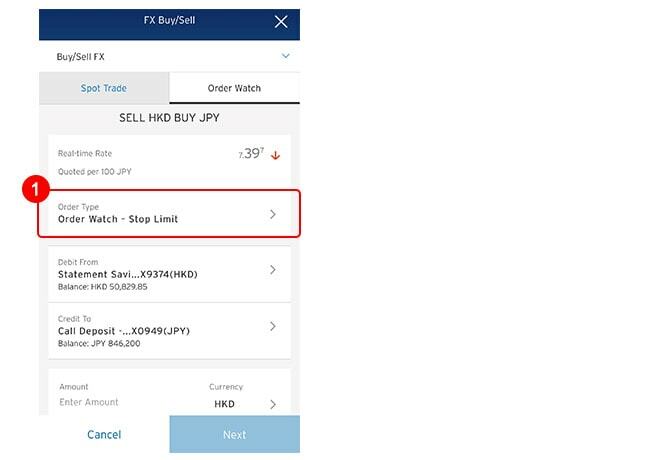 To allow you enjoy total peace of mind in trading foreign currencies, Citibank provides you with the 24-hour Order Watching Service on Foreign Currency Trading Transactions. Simply set up your order and we will buy or sell your designated currency automatically when the pre-set criteria are reached. Simply click on each of the following tabs to understand how each order type would help you to capture the opportunities or limit your losses at different market scenarios. If the spot rate of AUD/HKD is 1 AUD = 7.0990 HKD and you don't want to buy now but want to buy at a lower price, for example when 1 AUD = 7.0500 HKD. Place a "Normal" order to "Buy" AUD at 1 AUD = 7.0500 HKD. 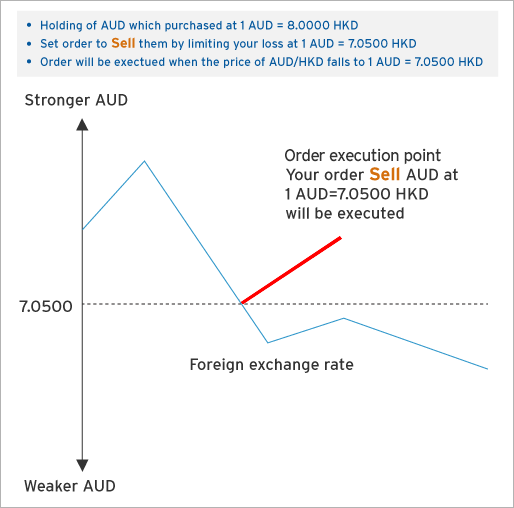 The order will be executed when the price of AUD/HKD falls to 1 AUD = 7.0500 HKD. 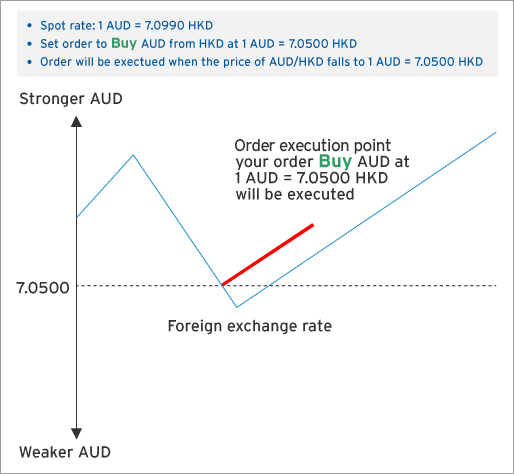 However, the order will expire if the price of AUD/HKD surges after the order is placed. The above illustrative example is hypothetical provided for illustrative purpose only. The scenarios are not based on the past performance of foreign currency. The Bank is not making any prediction of future movements In foreign currency by virtue of providing the illustrative example. It does not represent all possible outcomes or describe all possible factors that may affect the payout of a transaction in Foreign Exchange Order Watching. A "Stop Limit" order can help you to minimize potential losses or to protect unrealized gains at a pre-set level in adverse market conditions. You can place a "Stop Limit" order to "Buy" when the price rises to a specified price or "Sell" when market falls to a specified price. You are holding AUD purchased at 1 AUD = 8.0000 HKD. You assume the current trend is not to your advantage and so prepare to take a position to limit the losses. 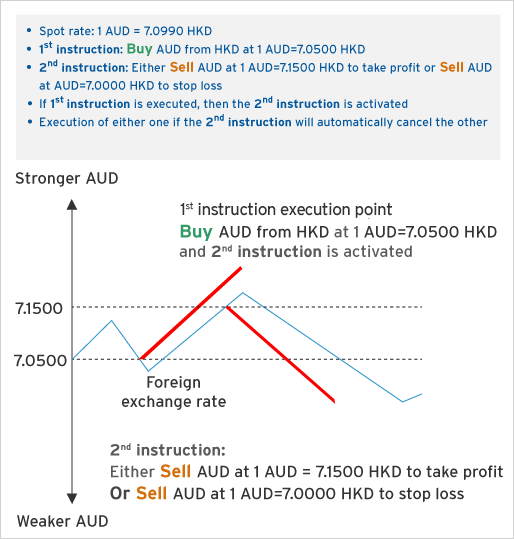 Place a "Stop Limit" order to "Sell" AUD/HKD by limiting your losses at 1 AUD = 7.0500 HKD. 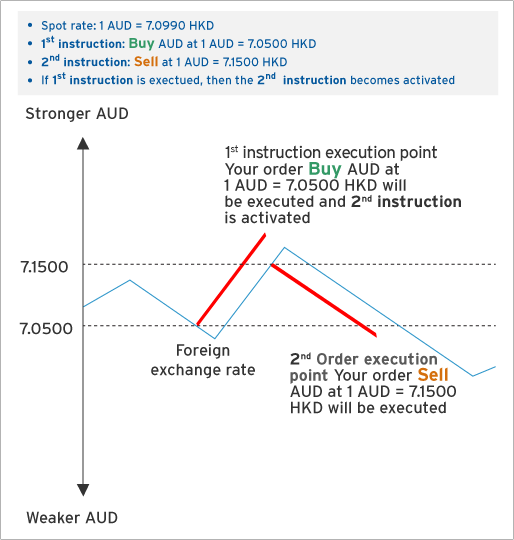 The order will be executed when the price of AUD/HKD falls to 1 AUD = 7.0500 HKD. After the first instruction is executed when you to take a position, the second will be activated so that you don't miss the chance to take profit. 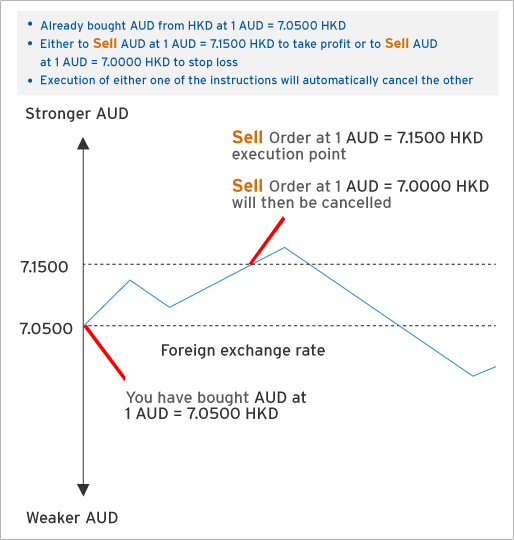 For example, the spot rate of AUD/HKD is 1 AUD = 7.0990 HKD and you place an "If Done" order to "Buy" AUD at 1 AUD = 7.0500 HKD and then "Sell" AUD if the price rises to 1 AUD = 7.1500 HKD. There might be a chance to take profit or a need to cut your losses. The "OCO" order helps you fix the profit or loss of your position. You are holding AUD purchased at 1 AUD = 7.0500 HKD. Place an "OCO" order to "Sell" AUD at 1 AUD = 7.1500 HKD to take profit, or "Sell" at 1 AUD = 7.0000 HKD to stem the losses. You can set both the take profit and stop loss orders at the same time, although the orders may not be necessarily carried out. Combination of the "If Done" & "OCO" orders. 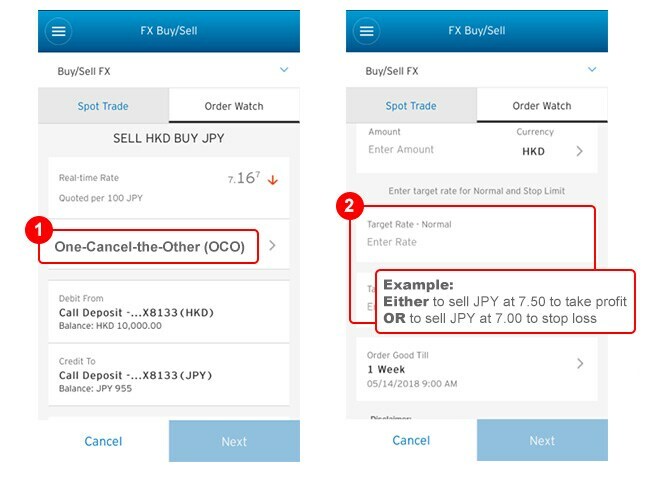 If the spot rate of AUD/HKD is 1 AUD = 7.0990 HKD, you can place an "If Done OCO" order to "Buy" AUD at 1 AUD = 7.0500 HKD and to "Sell" AUD at 1 AUD = 7.1500 HKD to take profit or "Sell" at 1 AUD = 7.0000 HKD to stem the losses. If the 1st instruction is executed then the 2nd instruction of either taking profit or stopping losses will be activated. This website is for information only and does not constitute any offer or solicitation to buy or sell. The risk of loss in foreign exchange trading can be substantial. Foreign currency trading is subject to rate fluctuations which may provide both opportunities and risks. Foreign exchange trading involves risk, including the possible loss of the principal amount invested. RMB exchange, like any other currency, is subject to exchange rate fluctuations. The exchange rate of RMB can go up and down. The applicable rate of RMB exchange is the offshore ("CNH") rates. 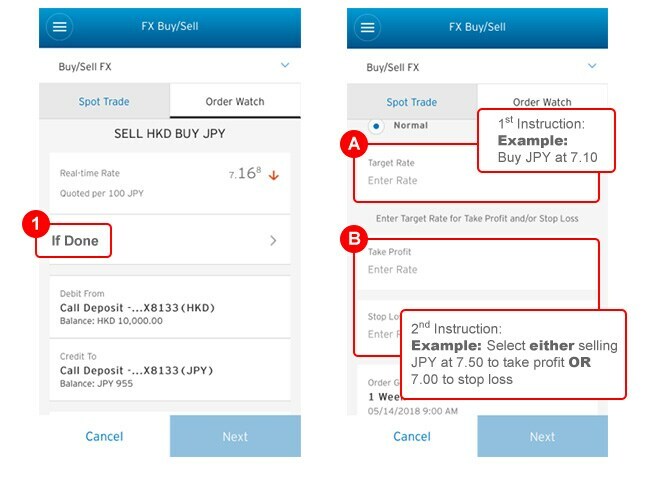 Placing contingent orders, such as "stop loss" or "stop limit" orders, will not necessarily limit losses to the intended amounts. Market conditions may make it impossible to execute such orders. Investors may experience a loss when they convert foreign currency back to their home currency. Foreign currency trading involves risk, including the possible loss of the principal amount invested. Investors should therefore carefully consider whether such trading is suitable in the light of their own financial position, investment objectives and risk profile. Exchange Controls imposed by the relevant authorities may also adversely affect the applicable exchange rate. Citibank (Hong Kong) Limited endeavours to ensure the accuracy and reliability of any data and information they provide but do not guarantee the accuracy or reliability of such data and information and accepts no liability (whether in tort or contract or otherwise) for any loss or damage arising from any inaccuracies or omission. The use of such data and information is at the user's sole risk. Such data and information of this web page are provided for personal use only and shall not be furnished to any other person or entity for any reason. Any copying, reproduction and/or redistribution of any of the documents, data, content or materials contained on or within the Citibank Online and/or provided through the services without the express consent from Citibank (Hong Kong) Limited is strictly prohibited.